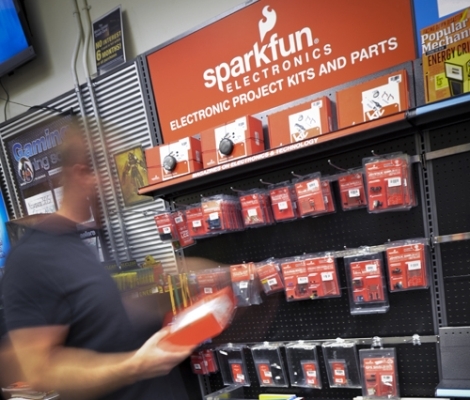 If you happen to live near a Micro Center retail store, you are now lucky enough to have another choice when it comes to purchasing DIY electronics components – SparkFun is selling their products at all Micro Center retail outlets. Known for being very DIY-friendly when it comes to building your own PC, Micro Center was a logical choice for SparkFun. There are definitely times when you need/want a part right away rather than waiting for it to ship, so this seems to be an ideal situation for hackers and makers within range of a Micro Center retail store. This announcement definitely has us wondering if this will be one of the final nails in the Radio Shack coffin. While Micro Center doesn’t have nearly the market penetration Radio Shack does, a wider selection of components and a friendly, knowledgeable staff makes the SparkFun/Micro Center combination is a compelling one. Would this maybe allow them to open more stores in central New York? I live relatively close to the Dallas Micro Center, I’ll be sure to check this out next time I’m there. Dunno if I’d describe their staff as “friendlt” and “knowledgeable” though. And Micro Center’s selection of DIY materials is about the same as Radio Shack’s for the most part. Sure they have computer components galore, but the selection is pretty for stuff like wire, soldering stuff, etc. *the selection is pretty bad for stuff like wire, soldering stuff, etc. I guess “friendly and knowledgeable” are relative terms. In my experience, they are more friendly an knowledgeable than anyone I have found in other local stores. In several trips to Frys, I have actually found the opposite. They refused to match their online pricing in store, but they offered me a public terminal where I could order the item and then pick it up at the front of the building. There was no way I was going to use my CCard on a public computer at Frys, so I simply walked out. Now I only shop there if I happen to be in the area and need a random component or when they are offering antivirus software for free after rebate. Ridiculous business policies are ridiculous. Isn’t it time for the FTC to investigate Fry’s constant shenanigans? Bait-n-switch. They have a sale item, something which would be very much in demand for the $2 sale price. But they have like 3 delivered to the store. The only stuff they have in stock it $15. How convenient. Fry’s will sell you a camera of phone with a built-in camera. But better not use it in the store! I didn’t have a note pad, and wanted to write down a few part numbers in the PC Board department. So I used my camera. The prissy clerk told me “no pictures”. No reason for the policy was revealed. Fry’s: What a bunch of jerks. They have had SparkFun stuff for a few months now, it is around the corner near the technical books on the left (for the Dallas store that is). you know radio shack is getting the full parallax line right? Yeah, I think I read that on some hardware hacking blog.. oh wait. I know they are going to be starting to stock some Parallax parts in their stores. I must have missed the part that mentioned the full line… citation please? Thus far the Parallax stuff I’ve seen stocked at Radio Shack has be badly overpriced. They solder a $3 accelerometer on a board then resell it for $30. Come, just sell us the damn chip. the Micro Center in St. Louis has had a section of sparkfun products (much like what you see in the photo topping this story) since at least february or march. I had heard they had Sparkfun, but couldn’t find it in the store. And I hate dealing with the salespeople there. They’re like flies when they see you walk by. Even after seeing one salesman get turned down right in front of them, they’ll ask if they can help. What area is the Sparkfun stuff? I’m only 100 miles away from that one! It’s just close enough! There is one in the twin cities though. Might not help much depending on what part of WI you are in. Radioshacks undoing is the fact employees who are willing to take their time to help you on your project (if they even have the ability) are not selling phones and are quickly shown other jobs can be more profitable to them. It is honestly not the product line that is lacking there, its the staff. One thing that made me chuckle was seeing parallax (forum posts) suggesting Makers go in and try to teach the staff at radioshack. They have to remember 5 different pre-paid cell companies plans and 3 or more contract companies plans. This really is a full time job in and of it self with all the gimmicks and marketing that makes those change , sometimes multiple times per month . Add to that the 200% markup on parts and radioshack is killing it self threw its desire to have all of its employees on a quota per month of how many cell phones they sell. That is why when you go in for a watch battery the salesmen is hounding you about the cell phone you already have stuck to your belt. If they dont , they get fired. Yet another reason why you shouldn’t wear your phone on your belt. Just curious: up until this post and the earlier quips that RadioShack is awful, this is the first time I noticed that brick and mortal stores are in demand. For years, we have seen a shift from B&M stores to online-only stores, and I’m wondering what is driving this shift back to B&M? Being able to see what you’re buying is one reason. I can’t remember how many times I’ve ordered something based on the size only to find out that it was the size of the shipping container, or that a part was missing, or that the description is off because they changed the design. Going to the store pretty much eliminates that. Also, you don’t have to pay overnight shipping fees if you want to use it then and there. Sadly, I’ve tended to live in areas where they HAVE to mark it up so much because there’s not enough hobbyists in the area to make it even worth their trouble at 400% markup, yet alone 200%. In a city with 20 million people, it’s a totally different deal. You can even have specialized stores like Tanners in the huge metro areas. People complain about the prices in parts stores in cities like Colorado Springs, but forget that there’s just plain not enough customers. Of course, when you charge $20 for a cable that people can buy online for $7 including shipping, it’s a wonder that stores like Best Buy even exist. But that’s a different type of ‘electronic part’ than we’re discussing. They get 1000% markups on those that know no better. I had no idea there were only 23 stores… I live about 30mins away from one when traffic dies down. Would like to check this out and pick up some Bawls! Saw these at the Westmont, IL store about a month ago. The selection was better than I expected. Still not a fan on Micro Center though, they have been going downhill lately in my opinion-maybe having to do with the massive flagship midwest Fry’s that moved in down the street, which also sells everything electronics component related. You mean the Fry’s in Downer’s Grove? That’s been there since 2004, hardly new. I was at the Micro Center in Paterson last month and saw the Sparkfun gear. It’s not a huge selection, and it’s not cheap, but it’s prominent enough to attract attention and get some people interested, and that’s what really matters. Wow, there are two of them in the Atlanta area! Yay for that. However, based on the website, it looks like an after thought. Their arduino stuff is buried in Accessories/GadgetsToys/Hobbies/RoboticBits&ElectronicParts. From looking at the website, I never would have guessed they had any prototyping stuff. Enough writing, I better get my suitcases ready for my trip to MicroCenter:-). Serial LCD, XBee components, Arduino shields (even a GPS shield ooo). Some how-to books, and beginners robotics/electronics kits. But other than that, looks like a rather limited selection guys. I hope Sparkfun is working on a similar deal with RadioShack or other places that actually have any brick & mortar presence. I only wish they carried a wider selection.. Perhaps as time goes on. I have a Microcenter near me. The Sparkfun offerings are very slim and still expensive. I am much more excited about the Parallax offerings coming soon! In the past, Parallax offerings were expensive. But, the new line looks like it will be much cheaper, wide variety, and actually useful to me. Having worked at a franchised RadioShack, I must say that I understand why the company has tried for many years to push the franchisees out of business. The corporate stores are all about cellphones and satellite dishes as has been mentioned earlier. The franchise stores are where you find the truly knowledgeable staff. I remember more than once walking into work and seeing my boss, the owner, soldering a 30-year-old part for some old timer, instead of telling them it’s “broken junk” and selling them this year’s version. Interestingly, he’s still running his store and still making as much as some doctors, whereas the parent company is slowly dying. I’m sure when RS finally folds he will just change the name of the store back to the original and keep on going. of all companies, you would think sparkfun would do away with packaging. just have it behind the counter and have people choose from a podium with a touchscreen. they really rotated the owl on this one. Microcenter in general is a gem to us computer geeks. i picked up my arduino uno from Microcenter and price was fair at 27.99. The diy stuff for the most part was located in the console gaming/pc gaming area. Microcenter used to have some heavy literature as well, but that has been cut back a bit. I don’t see how this can be the final nail in Radioshack’s coffin. First, 23 stores is nothing. Sorry, too far a drive for me and I am sure millions of others. Second… they hardly carry components. They are great for getting this module or that but apart from specialized ICs they don’t even try to be a component dealer. I’m not faulting them, just pointing out that that isn’t what they are about. They barely carry capacitors, resistors, inductors, transistors or even the more basic ICs like OpAmps, 555s, etc… They carry microcontrolers, interesting modules and specialized ICs plus some mechanical robot parts. The final nail in RadioShack’s coffin will be their attempt to re-enter the hobbyist market with their high prices and failure to recognize that things have changed. Hobbyists can and do go online now and get bags of parts, 100 or more for what they charge for little blister packs of 2. Radioshack will think they are getting a taste of what the hobbyist market is because they will get the occasional last minute I gotta have it now purchase. They will miss on just how big it really is though because most of us will still buy a lot more online and they will give up. As for carrying Parallax, Parallax makes some great stuff. I don’t mean to put them down at all but their stuff is also more expensive than the alternatives. Sometimes their products are worth the extra money. Compare for example the power and price of a Propeller and it’s development board to an Arduino. It’s great when you do but often you don’t need that extra power. Again, Parallax sells some great stuff but I think they might not help the image of a company whose products are already too expensive. I went to radioshack once and thought i was being both ripped off by price and choice of products. Happy enough when being back at my hometown Munich, Germany, i went to my 1970 style favourite stores in the what we call “red light district” where there is the combination repeating: electronics, nightclub, fastffood, brothel and again. Seriously if you come here, get your stuff. micro center??? yeah i’ll be shopping there instead of the 20 other cheaper places with 20x more parts that are actually 1/20 the distance from me. who cares what a retailer with 23 stores loosly scattered across the U.S. carries when you can’t get to one without a 2 & 1/2 hour drive? and why on earth would I buy a sparkfun kit (which even direct from sparkfun is vastly overpriced) with a markup attached on top? The conspiracy theories I’ve seen floated here are cute, but rest assured that I do not work for Microcenter. I work in IT full time and write here on the side because I enjoy the content as well as the hacker community as a whole. I would presume that if you needed any of the SparkFun items sold at MC “Right Now”, this is a great solution. If you live near 20 different places where you can source all sorts of electronics components at rock bottom prices, even on the weekend, please set up a distributorship – your fellow hackers would likely appreciate it. That said, I shop at MC occasionally when they have something that I need at the price I want to pay. I can’t find anyone (even online) that sells Intel processors for cheaper. I’ve stopped in to grab certain items when they are on sale, but by no means could I even be considered a regular. is there anything non arduino ? if you dont like it they have a website! why must radioshack use stupid over priced parallax? Heh, I’ve got two stores about an hour drive, and another about three hours from me. I’ve never noticed anything like this there though. Micro Center is at least trying to cater more to the DIY crowd. The sad fact is that we dont buy enough stuff to make it cost effective to inventory most small parts. Yeah see my other post. I’ve talked to some RadioShack managers and we talked about how it might make more sense to just have large grab bags and assortment kits of parts than the entire shelves dedicated to something that is a $1 item that most people coming in don’t buy 1 of. They’d rather have that shelf full of something with a faster turnover rate and larger price/item and margin. This is great. We don’t have this store in Canada, but there is a sparkfun distributer (http://www.creatroninc.com/) near my University and it is super convenient when you need parts fast. It is a bit more expensive, but still worth to prototype stuff. You can search sparkfun for the word ‘retail’ and arrive at a list of items potentially carried in a brick & mortar, nothing else they carry will be there though. As for the price, it’s right inline with what you’d pay at sparkfun plus shipping, so no big deal there. I consider sparkfun and the like a sort of boutique or niche stores, and once I apply those adjectives I almost expect a higher price. Then I apply the justification that I don’t have to kludge diy every aspect of the project, and suddenly it’s ok to pay. Used to work at Microcenter. Sorry to say that at my store, there wasn’t very much knowledge on Arduinos besides 1-2 employees whom aren’t in the right department to help you.